Cameron High School won the Marshall County Schools WV History Bowl again this year. Pictured from left, front row: Carley Anderson and Evan Dipasquale. From left back row: Coach John Sears, Alyssa Pettit, Gretchen Foster and Annie Martin. 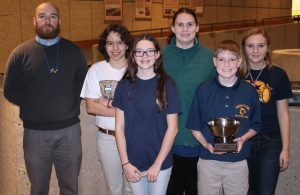 The 4th annual Marshall County Schools West Virginia History Bowl was held Monday at the Grave Creek Mound Archaeological Complex in Moundsville. Teams, made up of eighth grade students from all three county middle schools, competed in the tournament. Games consisted of two rounds, 10 minutes each, with 30 questions. The first round featured toss-up questions allowing a team to hit a buzzer to answer. Teams went back and forth answering questions in the second round. A team was able to steal a question from the other team if answered incorrectly or not at all. Cameron won the tournament to retain the Marshall County WV History Bowl Cup. Sherrard White grabbed 2nd place while Sherrard Red came in 3rd. Moundsville Orange ranked 4th and Moundsville Black was 5th in the series. All Marshall County Schools teams will compete again at the Region VI WV History Bowl on Friday, February 15, 2019 at Independence Hall in Wheeling. Two teams will advance to the state competition at the Culture Center in Charleston on Tuesday, April 30, 2019. Commissioner of the WV Division of Culture and History, Randall Reid-Smith founded the statewide competition in 2010. Cameron High School is the defending state champions.